Can Smokey Bear Survive a Forest Fire? Forest fires are an essential part of nature’s delicate balance. Emergency management planning for fire control should include recommendations for sustaining our environment. The future of inhabited urban areas will be better served by respecting nature than by attempting to control it. Most of us are hard-wired to fear fire. Even a picture can stimulate flight adrenaline. This led to the creation of the U.S. Forest Service in 1905 and kicked off 100 years of firefighting. With the environmental awakening of the 1970s, we recognized that not all fires are bad. Some fires actually have beneficial effects. Now our approach is changing. The result could be a policy to fight fire with fire. Wildfires are uncontrolled blazes fueled by weather, wind and dry underbrush that can burn acres of land—and consume everything in their paths—in mere minutes. This definition from National Geographic tells a story about wildfires. Wildfires are frequent occurrences. The National Interagency Fire Center has documented an average of 72,000 wildfires per year since 1983. The number doesn’t tell the whole story. The fires are getting bigger. More than 44 million homes in 70,000 rural communities are at risk of wildfire. Federal policy has been to put the fire out at all costs. When fire suppression challenges the budget, the budget caves in. The cost is covered by public and private resources, including private insurance. On the public side, the cost of fighting the fires is going up. The U.S. Forest Service budget for wildland fire management has increased from $1.9 billion in 2013 to $3.3 billion in 2017. In addition, the risk has gone up. The intensity of recent fires has put the life of firefighters at greater risk. The fact that wildfires occur primarily in the southwest raises questions of locational equity. People individually make decisions to build homes in areas that are known for fire risk. The costs to prevent, extinguish and repair wildfires are financed with taxes from all the regions of the country. One hundred years of putting fires out, coupled with timber harvesting and livestock grazing, have contributed to larger and more severe fires. 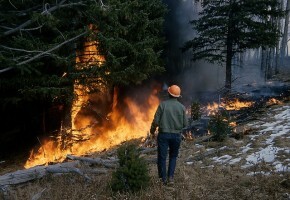 Fires now tend to be devastating high-severity tree-top fires instead of the historical fires which created a mosaic dominated by non-lethal surface fires. The lower temperature and limited intensity of those naturally occurring fires improved the ecosystem’s health and reduced fire hazard. WUI communities are exposed to an increased risk for wildfire damage. Climate change has increased the severity and frequency of wildfires. Drought dries the fuel, higher temperatures promote the untimely melting of the snowpack and extreme precipitation increases the risk of wildfires. With advanced technology, systems can be analyzed in detail based on their dynamic components. Science has found that wildfires can have beneficial effects on ecosystems. Standards have been developed to minimize the impact of wildfires on human habitat. Public and private resources can be more effectively deployed in prevention rather than suppression of fire. The National Park Service has adopted fire as a strategic tool in preventing destructive fires. Controlled fires can protect specific buildings, cultural resources, critical natural resources and habitats. Restore forested landscapes more effectively. Treat forests for the increasing effects of climate change. Prepare communities in WUI areas to minimize the destructive impacts of future wildfires. Communities have the option to learn to live with fire. The Fire Adapted Communities Coalition is a group of partners committed to helping people and communities in the WUI adapt to living with wildfire without compromising firefighter or civilian safety. The National Fire Protection Association (NFPA) provides detailed standards for creating fire-resistant structures. The USDA has noted, “What we observe after a WUI fire is, in varying degrees, structure survival.” The standards foster designs that reduce ignitability and increase fire suppression. These standards work with community-wide implementation. The state of California has been a pioneer in creating building codes for fire prevention and survival. The communities at risk of wildfires can implement changes to sustain the environment and make it possible for Smokey Bear to survive forest fires. Author: Minch Lewis is an adjunct professor at Syracuse University’s Maxwell School. He served as the elected City Auditor in Syracuse, NY, for nine years. He has developed financial management systems for the affordable housing industry. He earned his master’s degree in Public Administration at the Maxwell School. He is a Certified Government Financial Manager. Lewis can be reached at [email protected].